Ashley Wood, ASG vice president for academics, speaks at a community dialogue among peers and administrators. The event was held at Allison Dining Hall on Monday evening. 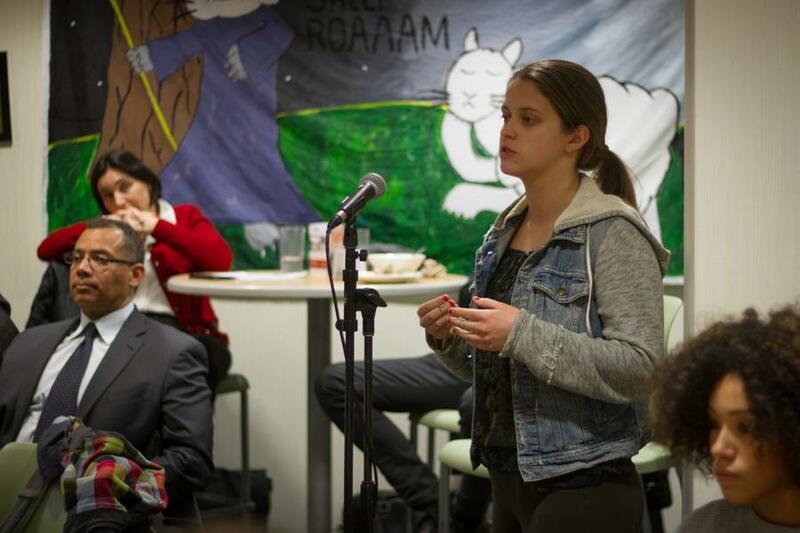 Students and faculty addressed upcoming changes to the Black House and a range of student concerns at a community dialogue held at Allison Hall on Monday. More than 70 people attended the community dialogue, which focused on “the student experience” and featured several University presenters who addressed students. Vice president for student affairs Patricia Telles-Irvin attended the event and spoke about the University’s progress in renovating the Black House. The Black House feasibility study steering committee — a group of faculty, staff, alumni and students — has been working closely with architects and meeting with various focus groups to collect input on the renovations, Telles-Irvin said. She also invited students to the Black House on Feb. 7 and 8 to engage with architects and contribute ideas about its interior renovations. Lesley-Ann Brown-Henderson, co-chair of the steering committee and executive director of Campus Inclusion and Community, moderated the event. She told The Daily that this particular community dialogue allowed administrators to follow up with students’ demands and provide updates on administrative progress. She said community dialogues have become more productive and added that she has seen higher turnout since they first began. “I’m hopeful that students are feeling encouraged or that there’s some motion forward,” Brown-Henderson said. Telles-Irvin also responded to student requests for the Black House and the Multicultural Center to be included on campus tours. She said although they have not yet been included, both locations are mentioned at the Segal Visitors Center before tours begin. She added that a new meditation space for Muslim students will be available in Technological Institute. Administrators are currently working with the physics and astronomy department to vacate the room and transform it into a meditation area, Telles-Irvin said. McCormick senior Camille Warren said she enjoyed hearing the perspectives of her peers, and that she appreciated having an open platform for students to share their concerns. The next community dialogue will be held in April.